The saltiness of Bacon with the sweetness of Toffee and the bitterness of semi-sweet chocolate is the perfect match!! Layer a jelly roll pan with aluminum foil. Put a glass measuring cup next to the pan. In a heavy bottomed pot over medium heat, melt the butter, sugar, and salt. Once the mixture has reached the right temperature, quickly stir in the almonds, and then the bacon. Brace yourself. The fat is going to melt off the bacon immediately and separate from the rest of the mixture. Pour it all into the jelly roll pan. It will start to set quickly, and the bacon fat will be liquid and on top. Lift the pan with one of the corners pointed down and pour off the fat into the glass measuring cup. Get as much of it as you can, turning the pan and dripping from the opposite corner as necessary. 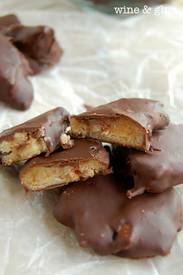 Let the toffee set for at least two hours in the refrigerator. Move to the freezer for an hour. Once the toffee is frozen, break it apart and keep it in the freezer. Melt the chocolate according to the package directions, and taking a few pieces of toffee out of the freezer at a time, dip it in the chocolate, setting it on wax paper to set.